What is an Aussie Christmas like? Pretty much the same except it is 30 C and people hang in a pool all day while they get drunk! I never made it to the pool. 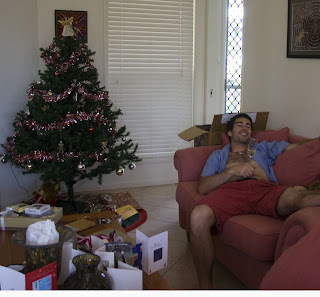 Here I am sipping Dom Perignon on Christmas morning after opening a free surf lesson and a 45 min. helicopter ride around Maui in May 2007 when I will be in Hawaii for my brother's wedding. That's all for now, Merry Christmas to all and Happy New year. Happy Holidays Brad! Hope you had a great Christmas! The photos are fantastic on the main page! Beautiful!